Osteoarthritis (OA) means inflammation of the joints although it is better known as a degenerative disease due to the inflammation of the joints with thinning of the articular cartilage. The cartilage in our joints allows for the smooth movement of joints. When it becomes damaged due to injury, infection or gradual effects of ageing, joints movement is hindered. As a result, the tissues within the joint become irritated causing pain and swelling within the joint. Joint Fluid Treatment is the replacement of the natural lubricants that are found in healthy joints. It's purpose is to increase joint lubrication and cushioning and to reduce the symptoms of OA. Hence, ease the pain. 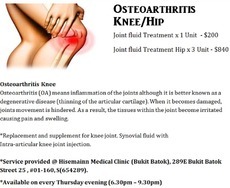 *Available only @ Bukit Batok branch on every Thursday 6.30pm to 9.30pm on appointment basis only. AposTherapy is a clinically proven drug-free and non-surgical treatment for joint pain such as that caused by knee osteoarthritis and other musculoskeletal disorders. AposTherapy specializes in the holistic treatment of Chronic Knee Pain, ... osteoarthritis is to ... tract that runs along the outer leg from the hip to the knee.